His father P. J. would have named him after himself, Patrick Joseph, but his mother reversed the names so Joseph wouldn’t be immediately marked as Irish. Joe Kennedy came from a comfortable home; P. J. was in the liquor business, engaged in local politics and had investments in a local bank, the Columbia Trust. Joe made many friends at Boston Latin School and Harvard College but realized early on that his comfortable existence was a far cry from the Yankee Brahmin society that held most of the wealth in Boston. Joe Kennedy at work. PD. 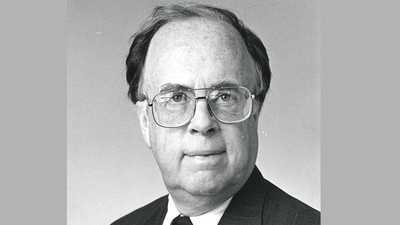 Early in his career, Joe’s job as state bank examiner made him privy to an attempt to take over the Columbia Trust, Boston’s only Irish-owned bank. His reward for organizing a successful resistance to the takeover was the job of bank president at age 25. The next year, he inaugurated an even more esteemed Irish institution by marrying the eldest daughter of Boston mayor John Fitzgerald. Rose Fitzgerald Kennedy bore the first of their nine children the following summer. As much as Joe doted on his family, he would have numerous extramarital affairs throughout his life. Kennedy applied his considerable business acumen to a series of profitable forays into various industries. He played the stock market in the heady days before regulation and cashed out before the Crash of 1929. He went to Hollywood to produce movies, but quit after a notable disappointment. He ran the Somerset Company, importing liquor after — and, it has been suspected, during — Prohibition. 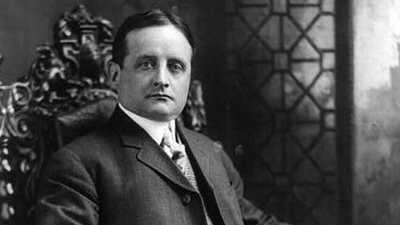 He owned Chicago’s Merchandise Mart, the largest office building in the world. Soon he was one of the richest men in America. The skills and contacts he acquired at each enterprise, by turns powerful, glamorous, and shady but always lucrative, proved invaluable for Joe’s career and for his sons’ futures. Joe’s involvement in politics began with his financial support of his father-in-law, Mayor Fitzgerald, during the reversed Congressional election of 1918. By 1932, he was backing a winner, Franklin D. Roosevelt. After refusing an ambassadorship to Ireland, Kennedy accepted the chair of the new Securities and Exchange Commission (SEC). Although commentators criticized the appointment, Kennedy served the SEC well for 14 months. After the next presidential election, Kennedy was made chair of the Maritime Commission, where he mediated between ship owners and unions — according to him, “the toughest thing I ever did in my life.” He finally received his plum assignment in 1937 as ambassador to Great Britain. The Kennedy clan arrived in London to fanfare and accolades. The welcome wore thin, however, as war first loomed, then arrived. 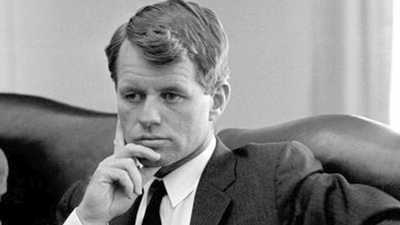 Kennedy’s public statements were regarded as defeatist and his decision to spend much of his time at a country estate away from the targeted capital was seen as cowardly. He met with German officials to promote German-American relations and found himself increasingly shut out of the close relationship between Roosevelt and his distant cousin Winston Churchill. Kennedy left his post in London and returned to the States shortly before the 1940 presidential election. Soon after Roosevelt’s third presidential victory, Kennedy gave an interview with The Boston Globe in which he expressed an isolationist view. Once America entered the war in earnest, Kennedy’s comments were destined to keep him from ever attaining higher office. His political career was over. In the aftermath, Joe funneled all his ambitions into his sons. Recognizing that he was their biggest liability, the father stayed in the background, financing and orchestrating campaigns but hardly appearing in public with his boys. Joe Jr., an isolationist like his father, had been groomed for political success but became a Navy flier in the war. He died over the English Channel on a mission. The mantle and responsibility fell to the second son, John. 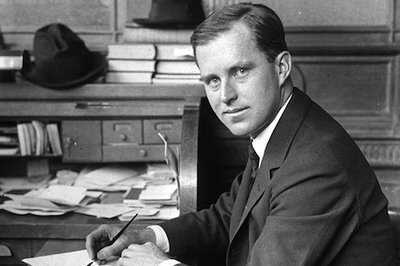 In October, 2003, Journalist Adam Clymer of The New York Times, author of Edward M. Kennedy: A Biography, discussed the youngest of Joe and Rose Kennedy’s children.